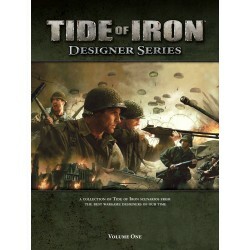 Tide of Iron Expansion Design Series Book - Games, Toys & more e.U. Compiled by distinguished conflict historian Dana Lombardy (Streets of Stralingrad), the Tide of Iron: Designer Series is a hardcover collection of twenty scenarios crafted by today's most famous wargame designers. Using the mechanics of the Tide of Iron base game, these design masters have crafted the first volume in one of the most exciting collections of wargaming history. The Tide of Iron: Designer Series is an incredible addition to the Tide of Iron base game, offering a whole new level of depth and historical context for players to enjoy. * Scenarios vary from short, fast-play skirmishes to massive tactical battles. * Historical backgrounds and anecdotes for each scenario written by the scenario designer. * Several scenarios incorporate the North Africa Days of the Fox Expansion. * One epic scenario which requires two copies of Tide of Iron for a massive, multiplayer experience.